To connect an iPod® to the vehicle so that the iPod® can be controlled with the audio system controls and display screen, use the USB connection port located on the center console below the heater and air conditioner controls. Connect the iPod®-specific end of the cable to the iPod® and the USB end of the cable to the USB connection port on the vehicle. 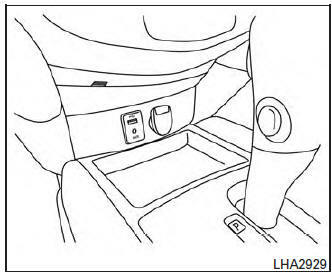 If your iPod® supports charging via a USB connection, its battery will be charged while connected to the vehicle with the ignition switch in the ACC or ON position. Place the ignition switch in the ACC or ON position. Press the MEDIA button repeatedly to switch to the iPod® mode. If the system has been turned off while the iPod® was playing, pressing the VOL/ control knob will start the iPod®. Press the iPod® MENU button while the iPod® is connected to show the iPod® operation menu on the audio display. Scroll through the menu list using the TUNE/FOLDER control dial. Press ENTER/SETTING button to select a menu item. For additional information, refer to the iPod® Owner’s Manual regarding each item. When the SEEK/CAT button or TRACK button is pressed for less than 1.5 seconds while the iPod® is playing, the next track or the beginning of the current track on the iPod® will be played. When the SEEK/CAT button or TRACK button is pressed for more than 1.5 seconds while the iPod® is playing, the iPod® will play while fast forwarding or rewinding. When the button is released, the iPod® will return to the normal play speed. All Repeat: all songs in the current list are repeated. Repeat Off: no repeat play pattern is applied. Track Shuffle: the tracks in the current list will be played randomly. Album Shuffle: the albums in the current list will be played randomly. Shuffle Off: no random play pattern is applied. When the BACK button is pressed, it returns to the previous menu.